A dry cleaning business can bring in a steady stream of profits when it is managed in a convenient and smart way and can offer valuable and quick service to its customers. 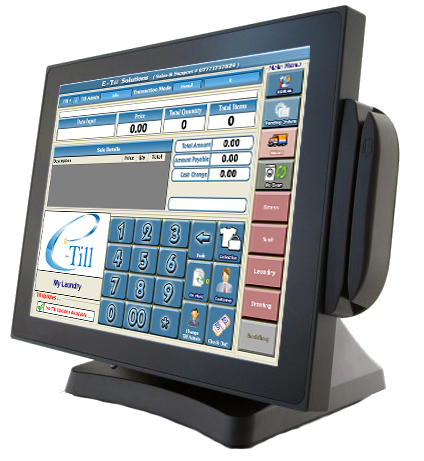 The EPOS System developed by EPOS Till System is a smart enough to deal with all the day activity of a drycleaner shop. It not only gives your customers a fast service but also serve as a Point of Sales system. People do not want to spend a lot of time at the dry cleaner, and they want hassles free service. If you go with our EPOS System your customer will experience great customer service. We never compromise on quality. 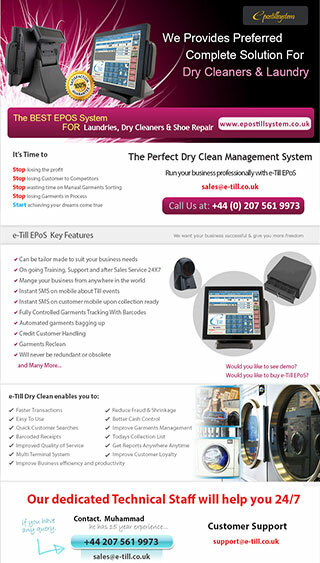 EPOS Till System UK have been deploying Dry Cleaners EPOS systems, Dry Cleaners Touch Screen Tills to many businesses throughout the UK for over 15 years. Established in 1992 EPOS systems, back office software as well as excellent after sales care and technical support throughout the lifetime of your system. Fast & Easy to Learn & Use. Online Querying System for Customers To Track Their Order. Garments/Products can be recognized by barcoded tags for fast & easy access. Inventory control helps you track garments in any location of your store. Eliminates Manual Paper-work and Managerial Headaches: Reduce the time you spend daily, weekly, monthly, quarterly, and annually on book-keeping and reports. Lets You Learn From Your History: e.g. Sale Reports & Charts can show you how a promotion affected your sales. Cash and Credit Card Mix Payment Option Available. Automatic acknowledgement to Customer through SMS about Garments Collection when Garments are ready. Cash, Credit Card Details provided on Z-Reading. SMS Alert About Z-Reading & Till Messages. Employee Clock IN/OUT to manage Work History & Salary. Instant Message from Back Office to Cashier.